I often analyze individual stocks on the dividend growth blog. Some if not most of the times however, after guiding readers through the company story I end up stating that the stock is either a hold or sometimes even a sell. This irritates most investors, who see the practice of reviewing a stock which results in a negative or neutral recommendation as a waste of their time. I definitely understand the frustration for those readers. Most investors typically want to be told what to buy, when to buy it and how much they would make when selling. This strategy always works in get rich quick books, but it seldom generates any profit in the real world. The reason why so many investors lose money on a consistent basis is because they fail to educate themselves and instead end up following gurus which don’t even trade the ideas they are pitching to their followers. The value of a stock analysis is that it should give investors ideas about what they want to see in a stock, versus what they don’t want to see in a stock. A prime example is my analysis of Paychex (PAYX), which is overvalued relative to its competitor Automatic Data Processing (ADP). In addition to being overvalued, Paychex currently distributed most of its earnings out as dividends, which is clearly unsustainable in the long run. Thus, the relatively higher dividends yield of 4% on PAYX versus 3.3% for ADP is not enough to compensate the risk of a potential dividend cut. Another reason why a neutral stock analysis is beneficial is that it provides investors with some insight into a company which could be temporarily overpriced. Since entry price matters to some extent, it would be unwise to pay top dollar for stocks, when there are companies with similar characteristics that are priced attractively. An investor, who does his or her homework early in the game, would be well prepared from reading the analysis to enter a position on dips, should the stock fall on general market weakness or on negative news. I completely agree with this assertion. Investors who purchased stocks in the late 1990’s when dividend yields were at their lowest have suffered inferior returns over the past decade. Other investors who finally saw some gains in their portfolios in 2009 might have been quick to take a profit too early, thus missing out on the majority of the rally off the March 2009 lows. Even if you purchased great stocks such as Johnson & Johnson (JNJ) or Procter & Gamble (PG) while their yields were at multi year lows, you would have seen no capital growth at best, although your dividend income would be higher than it was a decade ago. At the end of the day what truly matters is that investors develop a sound strategy that fits their personality and go with it. The strategy should incorporate entry and exit rules, diversification and hopefully some sort of position sizing methods such as dollar cost averaging. -Are High Dividend Stocks worth it? In Six Dividend Stocks for current income I provided a list of higher yielding dividend stocks, which investors could use for current income. With a high current yield, the stock list could provide a decent stream of dividend income for retired individuals. There lies another problem however. Most younger investors tend to ignore dividend stocks, which typically are mature, slower growing companies with dependable cashflows a portion of which are distributed back to investors. Younger investors view these dependable income stocks as boring and too slow moving, which don’t have anything better to do with their cashflows but send them back to owners in the form of dividends. Instead these investors prefer investing in growth stocks with high price earnings ratios and high expectations for growth. While most companies that distribute a portion of their profits in the form of dividends realize that double-digit growth cannot last forever, most growth stocks sell at rich valuations, supported by analysts who have perfected the art of predicting high growth rates for decades to come. As soon as the music stops, these growths stocks stumble, dragging investors fortunes with them. On the other hand the dividend stocks would have kept growing, albeit at a slower pace, and would have kept sending a higher stream of dividend income to shareholders, to be used at their own discretion. Many investors do not realize that unlike capital gains, dividends are real cash that bolsters your return. Dividends have also accounted for 40% of the annual average total returns of the S&P 500 over the past century. A company, which grows its dividend year after year, could end up paying a double-digit yield on cost to long-term investors over time. Companies that regularly pay dividends impose a discipline on managers to treat cash very carefully and thus make better decisions by adopting projects, which would generally improve the bottom line, without sacrificing return on equity. Thus dividend stocks, which consistently grow their payments, should be in every investor’s portfolio, irrespective of their age. A stock that regularly grows its distributions provides an inflation proof source of income, which is much more reliable than the Consumer Price Index, on which TIPs (TIP) rely on. A stock could afford to consistently raise distributions by selling products, which have a strong brand image, and thus are not easily substituted by others. Examples of such companies include Procter & Gamble (PG), Clorox (CLX), Pepsi Co (PEP), Wal-Mart (WMT) and Emerson Electric (EMR). 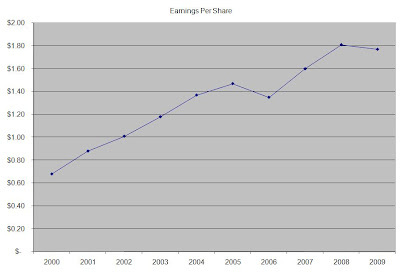 The Clorox Company (CLX) manufactures and markets a range of consumer products such as bleaches; cleaning products; water-filtration systems and filters; auto-care products; plastic bags, wraps, and containers; Over the past decade the company has managed to boost earnings per share at a rate of 13.60% annually. Clorox has paid uninterrupted dividends increased payments to common shareholders every year for 31 years. Dividends have increased at an average rate of 8.60% annually since 1999. Check my analysis of the The Clorox Company (CLX). Emerson Electric Co. (EMR), a diversified global technology company, engages in designing and supplying product technology and delivering engineering services to various industrial and commercial, and consumer markets worldwide. The company operates through five segments: Process Management, Industrial Automation, Network Power, Climate Technologies, and Appliance and Tools. The company has been able to increase earnings at an average rate of 8.40% annually over the past decade. Emerson Electric Co. has increased payments to stockholders for 52 consecutive years. The ten-year dividend growth rate is 7% per annum over the past decade. Check my analysis of Emerson Electric Co. (EMR). PepsiCo, Inc. (PEP) manufactures, markets, and sells various snacks, carbonated and non-carbonated beverages, and foods worldwide. The company manufactures, sells, and distributes Pepsi-cola beverages and is enhancing its distribution channels through its acquisition of key bottlers. The company has been able to increase earnings at an average rate of 9.90% annually over the past decade. PepsiCo has been consistently increasing its dividends for 36 consecutive years. Dividend payments have increased by an average rate of 13.50% annually since 1999. Check my analysis of PepsiCo, Inc. (PEP). The Procter & Gamble Company (P&G), together with its subsidiaries, provides branded consumer goods products worldwide. The company operates in three global business units (GBU): Beauty, Health and Well-Being, and Household Care. The company has been able to increase earnings at an average rate of 12.20% annually over the past decade. Procter & Gamble has been increasing its dividends for the past 53 consecutive years. Dividend payments have increased by an average of 10.90% annually over the past 10 years. Check my analysis of Procter & Gamble (PG). Wal-Mart Stores, Inc. (WMT) operates retail stores in various formats worldwide. It operates through three segments: Wal-Mart Stores, Sam's Club, and International. The company has managed to deliver an impressive 11.60% average annual increase in its EPS. 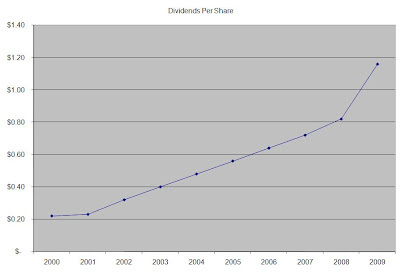 Wal-Mart Stores has consistently increased dividends every year for 35 years. Dividends have increased at an average rate of 18.90 % annually since 1999. Check my analysis of Wal-Mart Stores, Inc. (WMT). While these companies are poised to deliver strong long-term dividend growth, don’t throw caution away. These stocks should be a part of a diversified dividend portfolio with at least 30 components in it. Most novice dividend investors typically are under the impression that successful dividend investing entails finding and purchasing the highest yielding stocks. This strategy is flawed, because it does not take into account the sustainability of the dividend. A company, which yields 20%, might generate a much lower yield on cost over time. I purchased American Capital (ACAS) in 2008 when this business development company was trading at $30 and was yielding 13%. Just a few months later the company suspended its dividend payment, and I sold it immediately. The thing to learn from this example is that investors have to check the sustainability of distributions in light of cash flows generated by the business, the amounts of debt relative to total assets and the amounts of interest expenses. If you find a high yielding stock, which generates enough cash flow growth and has limited amounts of debt, then it could be a buy on the next dip. While companies are not contractually obligated to share profits with shareholders, it is nice to see when boards increase dividends and declare stock buybacks, This typically sends positive signals about management’s confidence in projected cashflows, generated by the business. In my portfolios I like to hold stocks with different yield/dividend growth characteristics. I do tend to focus mostly on the sweet spot of dividend investing, where yields are somewhere between 3% and 5% and dividend growth is in the upper single digits or in the double digits. I do realize however that some investors are interested mostly in current income generation, and not so much about future dividend growth. Thus recommending Wal-Mart with its 2% dividend yield to an investor who wants to generate as much income as possible now might sound ridiculous. Just because one wants to generate as much income as possible however, doesn’t mean that they should throw caution away with the wind. Sustainability of the dividend should be evaluated, in addition to sustainability of the dividend growth. A stock with a sustainable but unchanged dividend, which yields 9% on cost, would produce a lower inflation adjusted income level over time. In addition to that, most studies of portfolio durability show that one should not spend more than 4% of their portfolio value each year. If you have a dividend portfolio valued at $1 million dollars, which generates $40,000/year in dividend income, and whose dividend growth closely matches the inflation rate, you are ok as long as you don’t spend more than 40,000/year. If you spend more than that, you could end up eating your principal. I do have several ideas on stocks with sustainable dividends that could also afford to grow them over time. Realty Income Corporation (O) engages in the acquisition and ownership of commercial retail real estate properties in the United States. The company has increased dividends for 15 consecutive years. Check my analysis of this REIT. Kinder Morgan Energy Partners, L.P. (KMP) owns and manages energy transportation and storage assets in North America. This dividend achiever has rewarded unitholders with regular distribution increases for 13 years in a row. Check my analysis of this MLP. Consolidated Edison, Inc., (ED) through its subsidiaries, provides electric, gas, and steam utility services in the United States. This Dividend Aristocrat has raised dividends for 35 years in a row. Check my analysis of Con Ed. Altria Group, Inc., (MO) through its subsidiaries, engages in the manufacture and sale of cigarettes and other tobacco products in the United States. Philip Morris International Inc (PM) on the other hand manufactures and sells cigarettes and other tobacco products in markets outside of the United States of America. Before spinning off Kraft (KFT) and Philip Morris International (PM), Altria had an uninterrupted streak of 41 consecutive annual dividend increases. The spun out companies are also likely to return increasing amounts of profits back to shareholders in the form of share buybacks and dividend increases. I like both MO and PM for global exposure to tobacco. Check my analysis of both stocks. BP p.l.c. (BP) provides fuel for transportation, energy for heat and light, retail services, and petrochemicals products. This international dividend achiever has rewarded shareholders with dividend raises for 16 consecutive years. Check my analysis of BP. In order to increase portfolio longevity, I would also consider at least a 25% allocation to fixed income, which would provide some buffer during bear markets and deflationary environments. In addition to that, having an allocation to lower yielding stocks with higher dividend growth characteristics could also provide a buffer for dividend increases if you are lucky enough to spend more time in retirement. After all, the worlds oldest person on record was Jeanne Calment of France (1875–1997), who died at age 122 years. For a person retiring at the age of 60 or 70, this could mean planning for a 50 to 60 year retirement. Your goal should always be for your money to outlive you, no matter what. With the market up strongly year to date after hitting a multiyear bottom in March, it is hard for investors to get excited about current dividend yields of 3%-4%. It is even harder to convince an investor that a 3% yielder which manages to raise distributions by 10% annually over the next 7 years would lead to a yield on cost which is twice the current yield right now. Just a few months ago however, most investors realized that dividend income is always positive, even in a bear, after stocks tumbled over 50% off their all time highs that were hit in 2007. It is a great to achieve at least some return on investment, even when it feels that the whole world is tearing apart. Companies which maintain and even increase dividends show their confidence in their ability to generate enough in future earnings in order to cover the dividend raises. An especially bullish sign is when a company which has rewarded shareholders with a dividend raise for 37 consecutive years, raises dividends. PPG Industries (PPG), which manufactures and supplies protective and decorative coatings, increased its quarterly dividend by 1.9% to 54 cents per share. PPG Industries is a dividend aristocrat, which has raised distributions for 38 consecutive years in a row. The stock currently yields 3.40%. Duncan Energy Partners L.P. (DEP), which engages in gathering, transporting, marketing, and storing natural gas, as well as in transporting and storing natural gas liquids (NGLs) and petrochemicals in the United States, increased its quarterly dividend by 4.8% to 44 cents per unit. Duncan Energy Partners L.P. has raised distributions since 2007. The units currently yield 8.20%. Enterprise GP Holdings L.P., (EPD), a midstream energy company, which provides services to producers and consumers of natural gas, natural gas liquids (NGL), crude oil, and petrochemicals in the continental United States, Canada, and Gulf of Mexico, raised its quarterly distributions to 51.5 cents/unit. This distribution represents a 13.2 percent increase from the $0.455 per unit distribution declared with respect to the third quarter of 2008. Enterprise GP Holdings L.P., is a dividend achiever, which has raised distributions since 2000. This MLP currently yields 7.40%. Goodrich Corporation (GR), which engages in the supply of aerospace components, systems, and services worldwide, increased its quarterly dividend by 8% to 27 cents per share. Goodrich Corporation has only raised distributions since 2007. The stock currently yields 1.90%. Options are contracts that give their owners the right but not the obligation to buy (calls) or sell (puts) securities at a predetermined price (strike) at a predetermined period in the future. If an investor is bullish on Microsoft (MSFT) when the stock is trading at $20/share, he/she could purchase calls and profit at options expirations week if the stock price increases above the strike price plus the price paid for the call. The options price consists of time value/time decay and an intrinsic value, which is the difference between the strike price and the current price of the security. Overall in quiet markets the time decay decreases the values of options. The time decay portion of the options price is sensitive to changes in volatility and could increase if volatility increases however. Most investors believe that by selling covered calls or cash secured puts they could achieve additional income from the securities they own or plan to own. This additional return comes from taking on the additional risk of potentially exercising your options, which could hurt your total returns. The S&P maintains two options indexes based off the S&P 500. One of them incorporates selling covered calls against the index, while the other incorporates selling naked puts against it. The CBOE S&P 500 BuyWrite Index (BXM) is a benchmark index designed to track the performance of a hypothetical buy-write (covered calls) strategy on the S&P 500 Index. The methodology of the BXM Index is based on (1) buying an S&P 500 index portfolio, and (2) writing the near-term S&P 500 "covered" call option, generally on the third Friday of each month. The call is held until it is cash-settled on the 3rd Friday of the following month, at which time a new one-month call option is written. Ibbotson Associates tested the strategy of selling covered calls against S&P 500 for the 16-year period between 1988 and 2006. According to the findings, the buy write index returned 11.77%, versus 11.67% for the S&P 500 index. The buy-write strategy managed to slightly outperform the broad market with lower volatility, as defined by standard deviations. The standard deviation for the buy write index was 9.29%, which was much lower than the 13.89% volatility of the S&P 500. 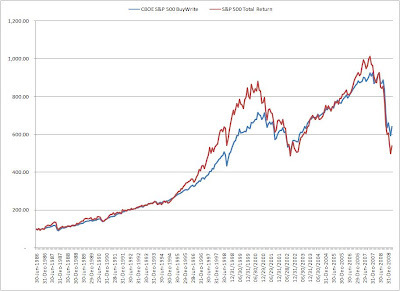 Overall for the past 23 years ending in March 2009, the buy-write index did manage to slightly outperform the S&P 500. The covered calls strategy typically outperforms the underlying in flat and weak markets, while under performing the underlying in strong bull markets. 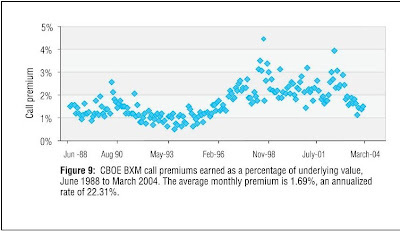 The chart below shows that as a percentage of the underlying value, premium income on covered calls has ranged between 0.5% to 4.50% and averaged close to 1.70%/month. Investors who dabble in options often see that they could purchase a stock at $20 and then sell a covered call at the next strike for $0.50, which represents a nice 2.50% return. Investors then start projecting and annualizing these kinds of returns. As evidenced by the first chart, these premiums are simply a compensation for foregoing any gains beyond the strike price, while fully participating in any declines in the underlying prices. They did not lead to the generations of any excess returns with any consistency relative to the cumulative performance of the S&P 500. There are several funds which employ covered call techniques on S&P 500 index. One of the longest standing ones is S&P 500 Covered Call Fund Inc. (BEP). Over the past 4 years it has had a total return of almost zero, despite the fact that it keeps distributing $2 in dividends every year. Thus on average, it is safe to assume that unless investors possess above average timing skills, selling covered calls is no free lunch, despite what gurus and self proclaimed experts claim this “safe” technique to be. Most companies use debt for a variety of reasons in their operations. It could be either short term or long-term obligations. If there’s anything the 2007-2009 financial crisis has taught us, it is that excessively leveraged companies could easily blow up after a chain of negative events. Thus it pays to know what the debt situation for a particular company you are investing in actually is. Some investors typically focus on debt to total assets to gain a perspective on the amount of the leverage the company has. While this method is widely accepted by some investors, I believe that it has some shortcomings, which might prevent investors from seeing the bigger picture. Most importantly comparing debt to total assets does not tell whether a company could service its debt obligations or not. When you decide to get a loan from your bank, one of the most important questions they have is what your income has been, rather than provide a list of your assets and debts. Only when you provide a proof that you could service a new line of credit, would your banker provide you with a loan. One method that I prefer is comparing annual earnings before interest and taxes to the amount of annual interest expense paid. While this ratio would vary for different types of enterprises, it should never the less provide an important glimpse to a company’s ability to service its debts when its trended over several years. You can open the table from this location. Dividend investors should generally look for a higher coverage ratio of interest payments. A lower coverage indicates that a decline in earnings could generally make it difficult for the company to service its debt, which could not only jeopardize its dividend payments but also could lead to bankruptcy down the road. RPM International Inc. (RPM), which operates as a food company in North America and internationally, increased its quarterly dividend by 2.5% to 20.50 cents per share. RPM International Inc. is a dividend aristocrat, which has raised distributions for 36 consecutive years in a row. The stock currently yields 4.30%. ConocoPhillips (COP), which is the fourth largest integrated oil and gas company in US, increased its quarterly dividend by 6% to 50 cents per share. This is the ninth consecutive annual dividend increase for ConocoPhillips. The stock currently yields 3.80%. ONEOK Partners, L.P. (OKS) engages in the ownership and management of natural gas gathering, processing, storage, and interstate and intrastate pipeline assets, as well as natural gas liquids (NGLs) gathering and distribution pipelines. This Master Limited Partnership increased its quarterly distributions by 0.9% to $1.09 per unit. ONEOK Partners has consistently raised distributions only since 2006. The MLP’s units currently yield 8.10%. "The distribution increase reflects the benefit of our recently completed growth projects, which have increased our fee-based earnings, as well as an improved capital market environment," said John W. Gibson, chairman and chief executive officer of the general partner of ONEOK Partners. "As volumes behind these projects continue to ramp up, we anticipate additional opportunities to increase our distributions in the future." Reynolds American Inc. (RAI), which operates as a food company in North America and internationally, increased its quarterly dividend by 5.9% to 90 cents per share. Despite the fact that Reynolds American Inc. is not a consistent dividend raiser, it has increased distributions by 132% over the past decade. The stock currently yields 7.70%. ConocoPhillips (COP) looks like an interesting candidate to add to my watchlist. I would keep current on any events in the company and would look to initiate a position there on dips, provided that such opportunities arise. SYSCO Corporation, through its subsidiaries, markets and distributes a range of food and related products primarily for foodservice industry. SYSCO Corporation is a dividend champion as well as a component of the S&P 500 index. It has been increasing its dividends for the past 38 consecutive years. For the past decade this dividend growth stock has delivered an annual average total return of 6.20 % to its shareholders. At the same time the company has managed to deliver an 11.20% average annual increase in its EPS since 2000. For the next two years analysts expect EPS to increase to $1.81 and $1.92 respectively. The main problem for the company right now is the slowdown in sales at US restaurants, which account for more than 60% of revenues for this food distributor. Other than that the growth prospects for the stocks exist not only through internal growth but also through acquisitions as well. Building regional distribution centers and better inventory management are two of several initiatives that the company is applying for internal growth. International expansion could also be another opportunity for Sysco. The returns on equity have increased slightly over our study period to a very respectable 30.80% in 2009. Annual dividend payments have increased by an average of 20.30% annually over the past 10 years, which is much higher than the growth in EPS. Some of it came from stock buybacks and some of it was a result of expansion in the dividend payout ratio. A 20% growth in dividends translates into the dividend payment doubling almost every 3 and a half years. If we look at historical data, going as far back as 1975, we would see that Sysco has indeed managed to double its dividend payment every three and a half years on average. Over the past decade the dividend payout ratio has more than doubled to 65% in 2008. While the dividend is well covered based off current cash flow/share, the company would most probably have to slow down or stop dividend increases until earnings growth picks up again. The stock buyback program could also be put on hold as a result of this as well. A lower payout is always a plus, since it leaves room for consistent dividend growth minimizing the impact of short-term fluctuations in earnings. I believe that SYSCO Corporation is attractively valued with its low price/earnings multiple of 14, as well as an above average dividend yield at 3.80%. The high dividend payout ratio makes this otherwise great stock a hold for the time being however. I would only consider investing in Sysco at this time as part of a dividend reinvestment program. The financial crisis lead to dividend cuts amongst several prominent dividend payers such as Bank of America (BAC), US Bancorp (USB) and BB&T Corp. (BBT). Over the past few weeks however, several financial companies announced that they might reconsider their current dividend policies and start raising distributions in the near future. US Bancorp’s (USB) CEO is reviewing the company’s dividend payout, after it paid off $6.6 billion in TARP money back to the US Treasury. "You will see us take action in the near-term that will be favorable," to the dividend, the company’s CEO said. The company cut dividends in March by 88% and is currently paying a quarterly dividend of 5 cents/share. BB&T’s (BBT) President and CEO Kelly King informed shareholders the bank will "revist dividend level as soon as appropriate". The company cut its dividend by 68% in May 2009 in order to be able to repay the US Treasury. In addition to that the Winston-Salem, North Calorila based banking institution sold $1.5 billion in stock. JP Morgan’s (JPM) CFO was a little less optimistic about the future dividend prospects of his company, citing that the company’s goal is to restore dividend only if economy doesn't "double dip". Despite the fact that he is still cautious on restoring the dividend, the CFO said the bank could raise its dividend to $0.75-$1.00/share. The company cut its dividend by 87% to 5 cents/share in February 2009. Analysts are also expecting Pfizer (PFE) to increase dividends as well in the near future. Deutsche Bank analysts expect Pfizer Inc to increase its dividend in December. Deutsche Bank sees an increase of 15 percent to 25 percent. Pfizer cut its dividend by 50% in January in an effort to conserve cash in order to pay for its acquisition of Wyeth (WYE). While I am generally very skeptical about companies which cut distributions, I view companies that begin raising distributions within a year of the cut very positively. It is too early to get excited about the companies listed above however. As long as they fail to actually increase distributions by sending bigger checks to shareholders, then the prospect of them raising dividends is a pure speculation. 1) Use this link to access the special promotion, which would land you to a special page:Open a TradeKing account today and get a $50 signing bonus! 2) When you open and fund your account with at least $2,500 and make your first trade within 180 days of account opening, you will receive a $50 bonus deposited into your account. 3) You have to be a new client to participate in this offer. Open a TradeKing account today and get a $50 signing bonus! "To qualify for this offer, new accounts must be opened and funded with $2,500 or more. Account funding must occur within 30 days of account opening, and one trade must be executed within 180 days of account opening, for account to qualify. Offer is not transferable or valid in conjunction with any other offer. Open to US residents only. One offer per household. TradeKing can modify or discontinue this offer at anytime without notice. The minimum funds of $2,500 must remain in the account (minus any trading losses) for a minimum of 6 months or the credit may be surrendered. Other restriction may apply." Back at the end of 2008, I was invited to participate in a stock picking competition by selecting 4 stocks. At the time I simply included the highest yielding stocks in my portfolio – Con Edison (ED), Realty Income (O), Phillip Morris International (PM) and Kinder Morgan (KMP). I believe that as a whole, these stocks would provide dependable income for individuals seeking high current income today. These stocks also possess strong dividend growth characteristics as well, which is essential for investors to keep up with inflation if they spend all of their distributions in a given year. Realty Income Corporation (O) engages in the acquisition and ownership of commercial retail real estate properties in the United States. The company is widely held among dividend investors, and is known as the “Monthly Dividend Company”. Since Realty Income went public in 1994 it has raised dividends consistently, often more than three times per year. Some investors are concerned that Realty Income has a high dividend payout ratio, which stops them from purchasing its shares. The truth is that real-estate investment trusts have to distribute all of their earnings to shareholders in order to avoid being taxed by the IRS. Thus, a more useful gauge for Realty Income’s dividend coverage is its Funds from Operations, which includes earnings per share and certain non cash items such as depreciation expense for example. This dividend achiever currently yields 6.5%, and is up 18.8% year to date. Consolidated Edison, Inc., (ED) through its subsidiaries, provides electric, gas, and steam utility services in the United States. People still keep using electricity at the same rate even during recessions, as do businesses as well. This being said, Con Edison’s revenues so far this year have been lower, in comparison to their levels from last year due to the overall weakness in New York’s economy as a whole. The company also recently managed to receive a lower than anticipated increase in its rates to customers. In addition to that there is some uncertainly about the utilities sector as a whole and the smart grid project, which would turn out to be very costly, especially if government subsidies do not cover a major part of those projects. I do like the fact that Con Ed has raised dividends for 35 consecutive years, despite the fact that raises have come at a 1% annual rate as of recently. This dividend aristocrat also spots a healthy 5.7% yield, which a good compensation if you seek current income for the next 5 - 10 years. The stock is up 11.0% year to date. Philip Morris International Inc (PM) manufactures and sells cigarettes and other tobacco products in markets outside of the United States of America. The company was spun out of Altria Group (MO) in 2008. While it does face declining demand in Western Europe, which accounted for a little less than 50% of its operating income, the company could benefit from growth in emerging markets such as China or India as well as from strategic acquisitions. Add in to that the strong shareholder focused culture of Altria Group, which has always tried to deliver strong and consistent dividend growth and buybacks, and you have a recipe for success. Tobacco usage is not going to stop just like that no matter how much taxes are being levied on the products. The stock currently yields 4.8%, and is up 16.4% year to date. Kinder Morgan, L.P. (KMP) owns and manages energy transportation and storage assets in North America. The company’s business is all about transporting oil and natural gas in the US, and thus it is not as affected from the rise and fall of energy prices as major producers such as Exxon (XOM) or Chevron (CVX) typically are affected. MLP’s in general are mostly indifferent to fluctuations in commodity prices because they are paid to transport not produce commodities. MLP’s like Kinder Morgan (KMP) typically receive a fixed fee for moving a product over a certain distance through their pipelines. In addition to that there is little competition between pipeline companies for business, as they are almost monopoly like businesses. Thus, their revenues tend to be rather stable. Kinder Morgan is eyeing expansion, which would be accretive to distributable cash flows per unit for the near future. Kinder Morgan has raised distributions for over a decade, and as such it has been included in the dividend achievers index. The company’s units currently yield 7.7%, and are up 25.7% year to date. Year to date the portfolio has produced a total return of 17.99%, which is not too bad for a conservative basket of stocks. The price return is only 12% however, which goes on to show that holding dividend stocks during a downturn could be especially rewarding if distributions get reinvested at lower prices. I would like to emphasize the fact that successful dividend investing is a long-term process. I strongly doubt that a time frame of less than 15 years is indicative of whether the performance of the stock picks above is sustainable or not. Having a diversified portfolio of at least 30 individual companies from several sectors, sizes and locations is essential in order to be diversified and avoid taking unnecessary risks. Check out the Best Dividend Stock for the Long Run list, which is a good addition to today's post.